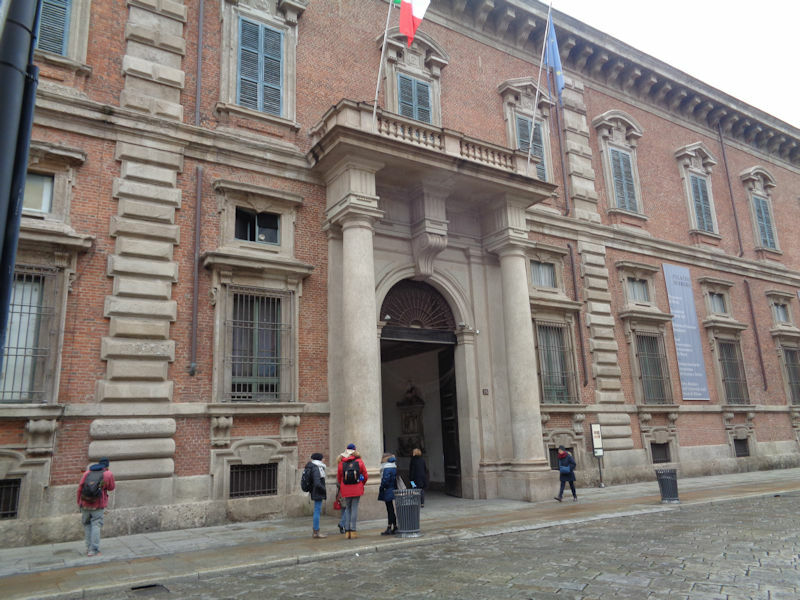 We're staying in Lodi, just 30km south of Milan, and part of the point of that is to spend at least one day visiting again the great Pinacoteca di Brera and the Sforza Castle just down the street in central Milan, a couple of Metro stops from the Milano Centrale rail station. 23 February 2018. 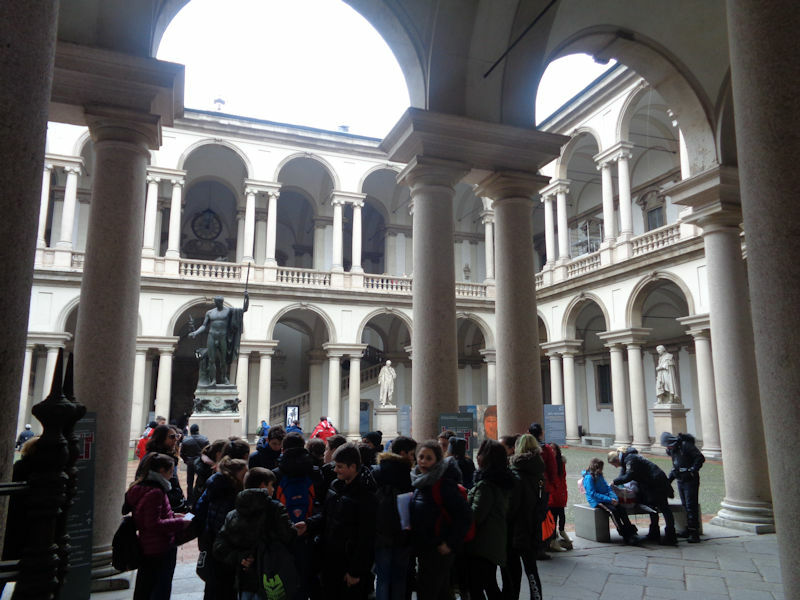 The Palazzo Brera was originally a 14th century monastery of the Umiliati order and then a Jesuit college, though most of the present building was developed by the architect Richini in the 1620s. 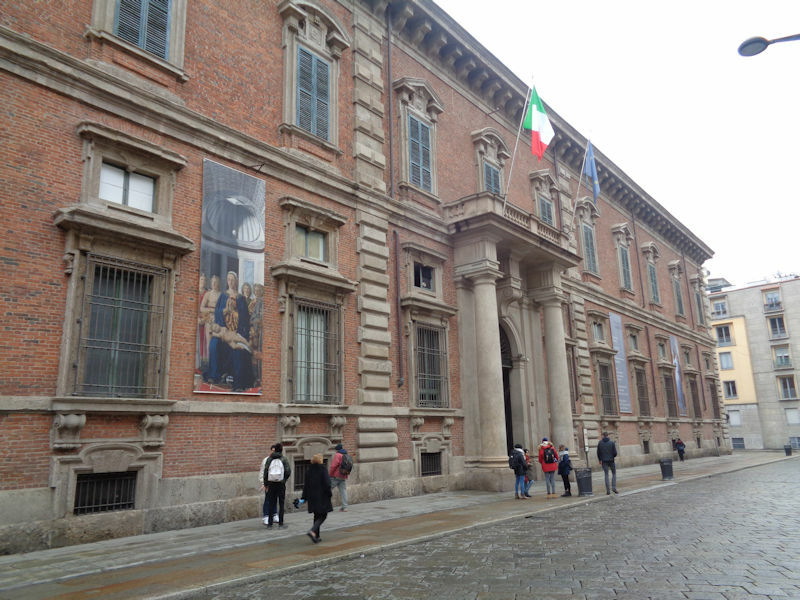 When the Jesuits were disbanded here in 1773, the palace became state property, and the Austrian Empress (and Duchess of Milan) Maria Theresa turned it over to a variety of cultural institutions. 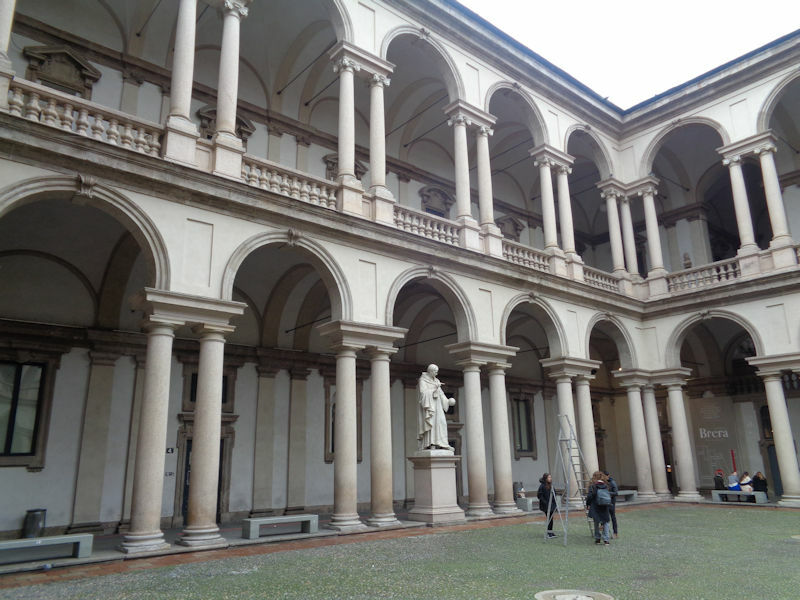 The palace includes, in addition to the art gallery, an academy of fine arts, the Lombard Institute of science and letters, the Braidense national library, an astronomical museum, and a botanical garden. 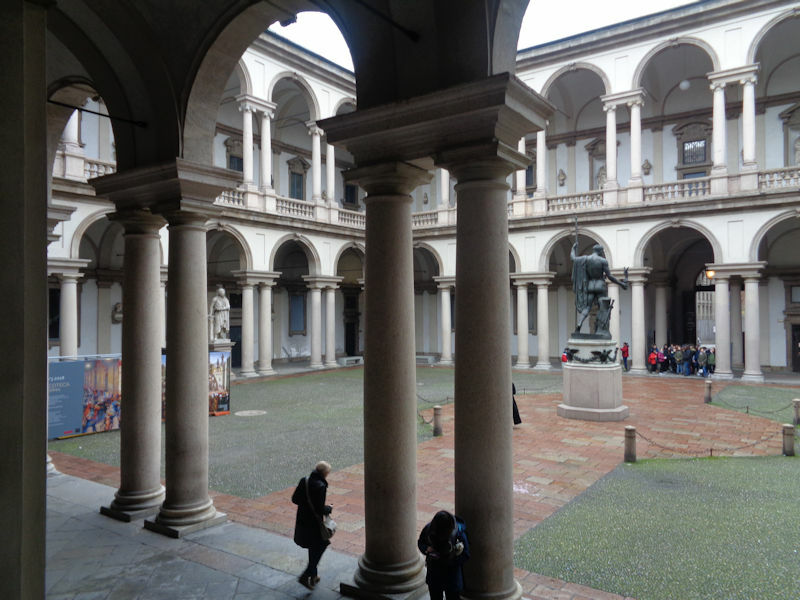 The public art gallery was instituted in 1809 to showcase works of art from all areas that had been conquered by French armies (like northern Italy) -- soon, with the dissolution of the religious orders at the time, pictures confiscated from convents and churches were added to the collection rapidly, which, it's said, explains the fact that a majority of the works on display have religious themes. 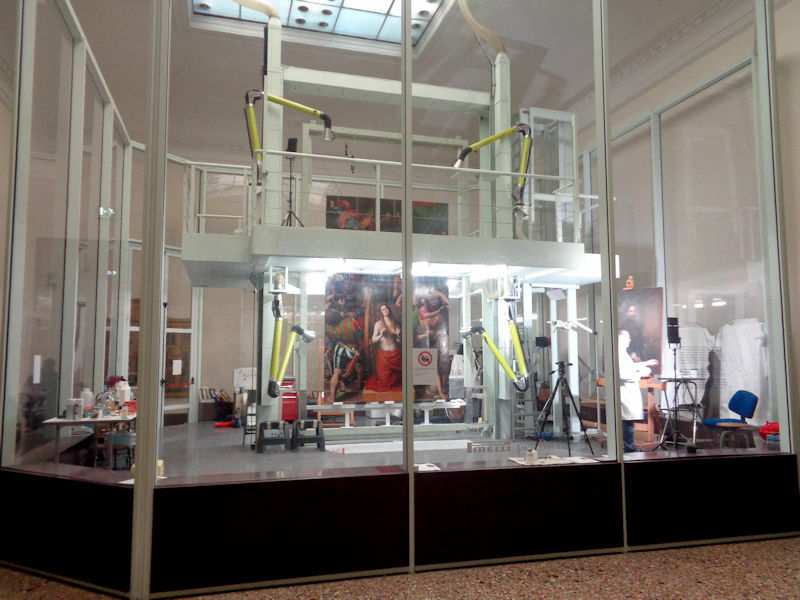 The bronze statue of Napoleon as the god Mars was set up in 1859 from a design by Canova. 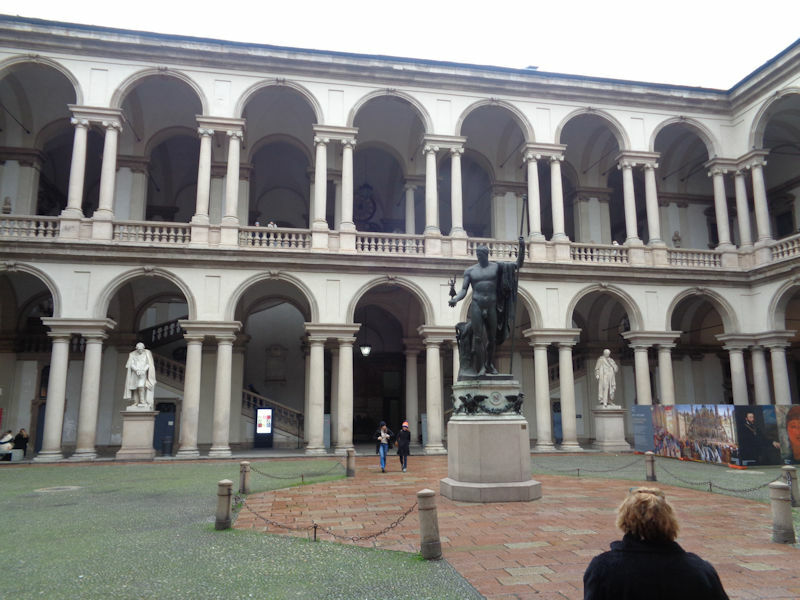 The name 'Brera' is said to derive from a Lombard term for a large space cleared of trees and is cognate with the Dutch city of Breda and our word 'broad'. Located just outside the medieval city walls, this area had been kept cleared to maintain a field of defensive fire if needed. 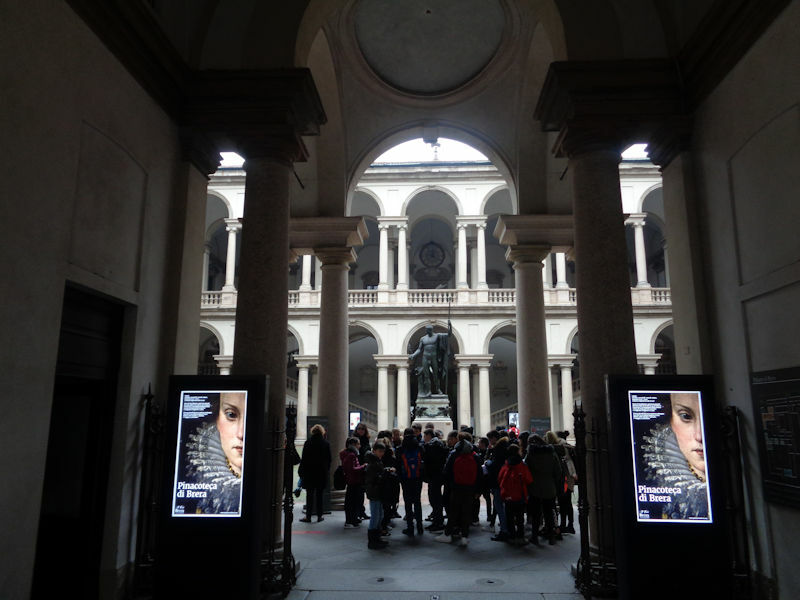 The pinacoteca is up on the first floor. 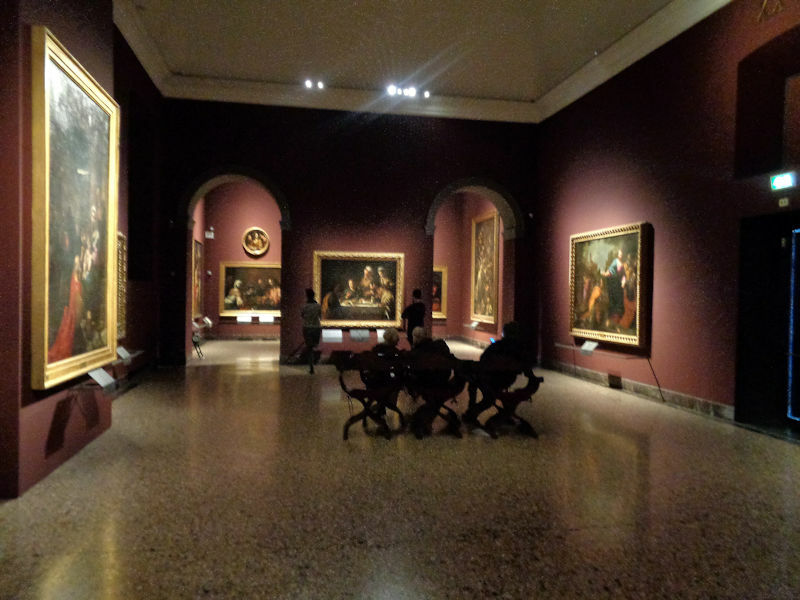 The good news this time is that we are now a "No Flash" art gallery; for years, and at the time of our last visit, it was a rigorously "No Photo" gallery, which, for tourists with faulty memories of what they've seen, removes more than half of the purpose of the visit. 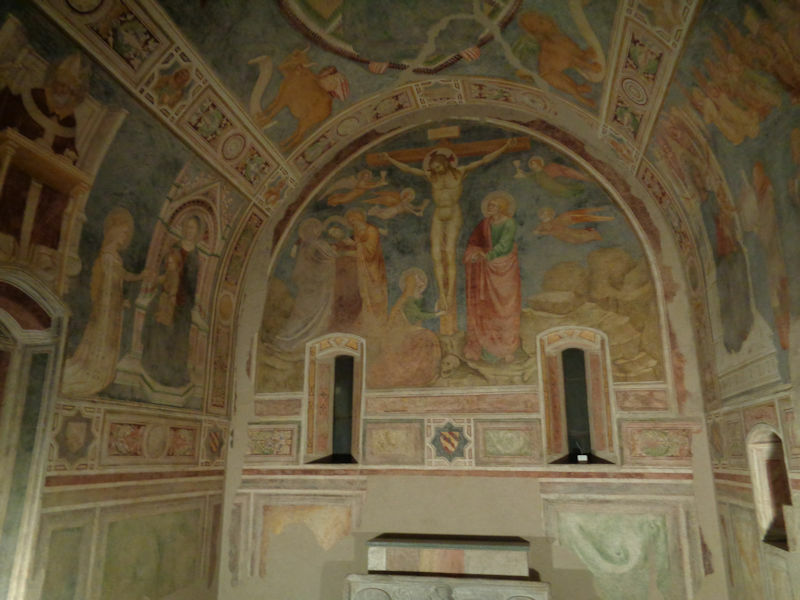 The Cappella di Mocchirolo near the entrance, a reproduction of the 14th century original. We'll start through the medieval sections, the favorite for some of us. 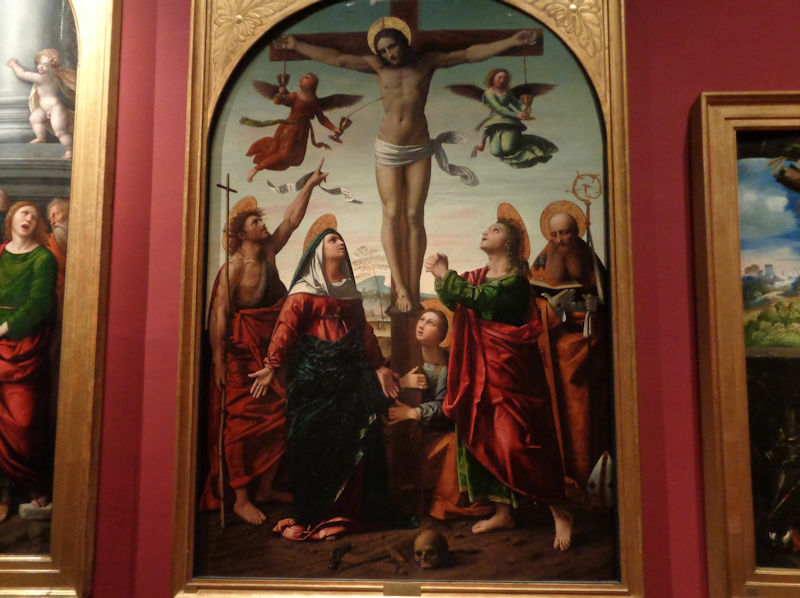 Great poses in the sorrowful ladies; the 'Crucifixion' is by Gentile da Fabriano, ca. 1408 -- the label explains that the absence of naturalistic imagery, like vegetation or animals, is characteristic the late Gothic. 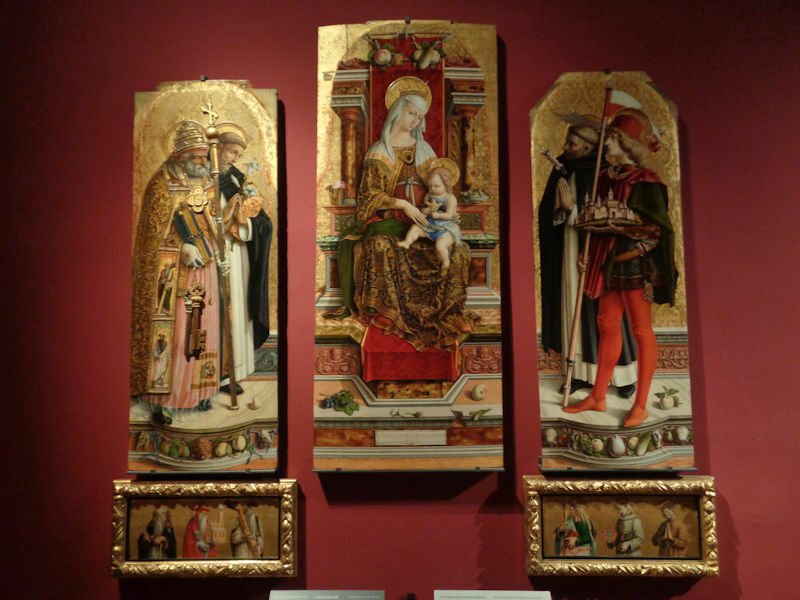 A small polyptych, evidently a private altar from a convent in Venice, showing Madonna and child, St Anthony the Abbot, John the Baptist, St Andrew, and St Victor, and below: St Catherine of Alexandria waving her wheel, St Nicholas of Myra, St Mark with his book, and St Lucy. 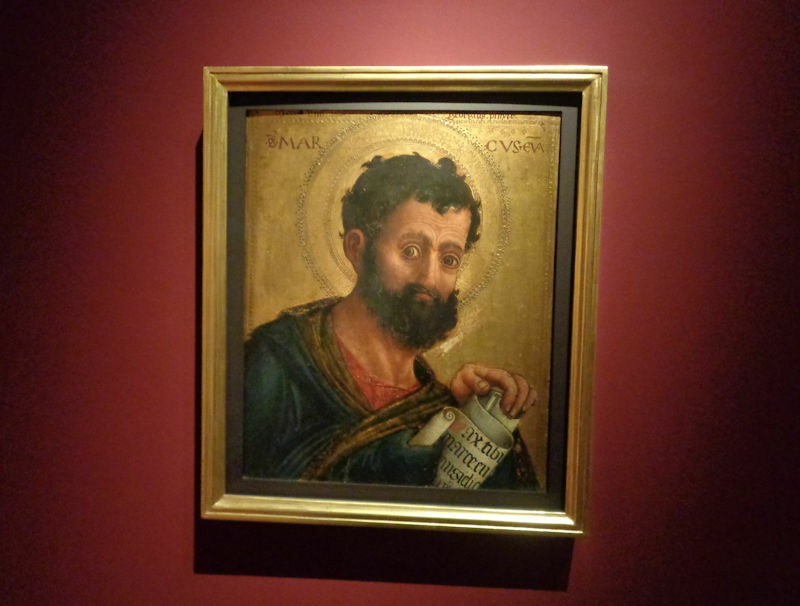 It's attributed to Lorenzo Veneziano, ca. 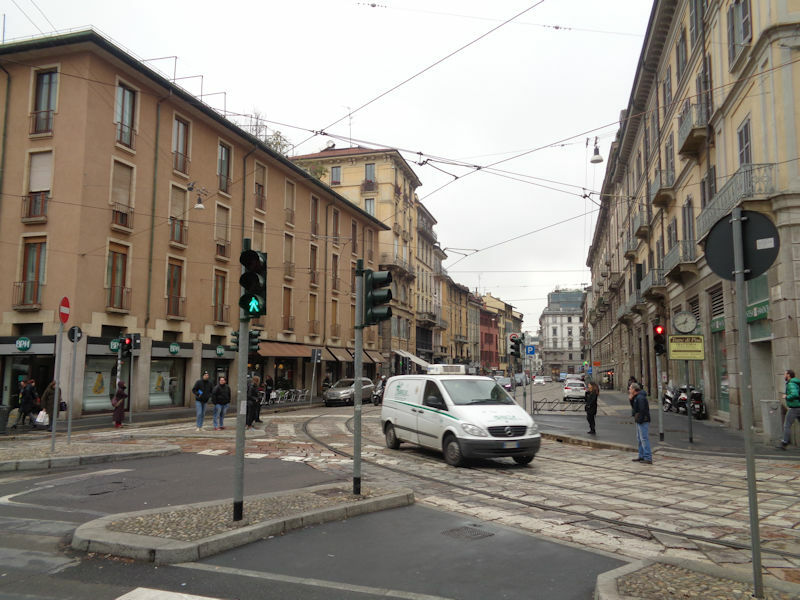 1370, who seems to have specialized in these things, and it still has its original woodwork. 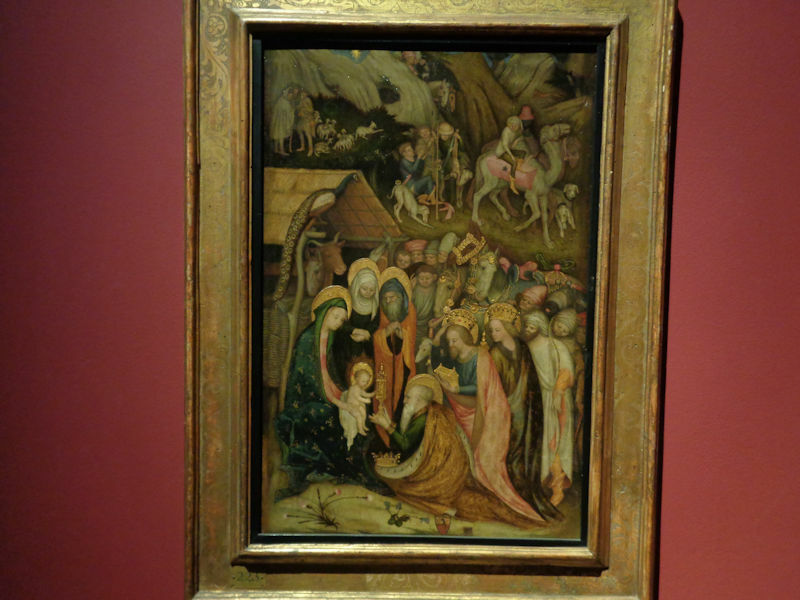 A very busy 'Adoration of the Magi' ascribed to Stefano da Verona, ca. 1435 -- it's got all of the usual parts of the conventional Magi story plus camels, a peacock, and a bunch of hunters boozing it up in the middle background. 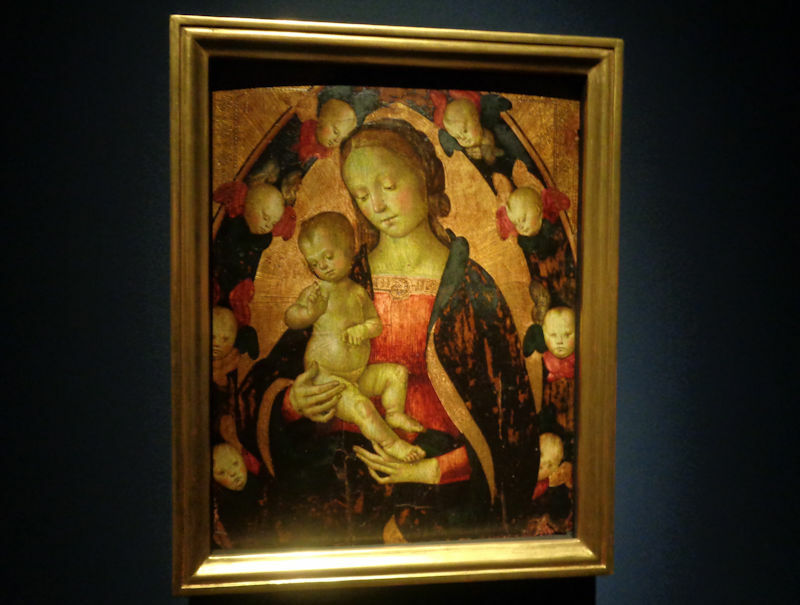 A very nice 'Madonna and Child' by Il Bergognone (ca. 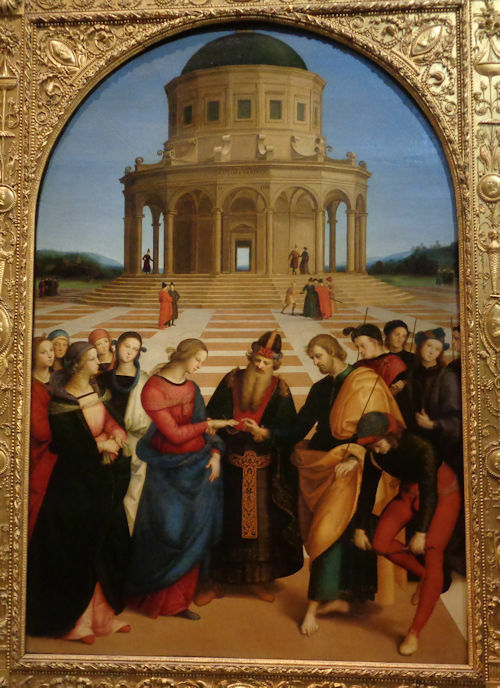 1450-1523), who was very active in the decoration of the Certosa di Pavia. The disembodied hands waving about over her head about to be crowned used to belong to God, but that part of the fresco didn't make it off the wall. 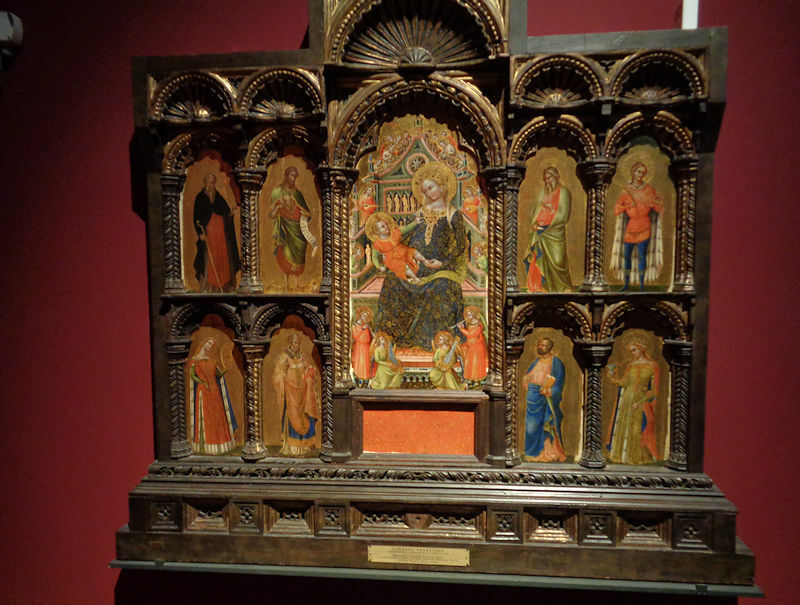 This, called the 'Praglia Polyptych', is attributed to the mid-15th century Antonio Vivarini and brother-in-law Giovanni di Alemagna, and makes a perfect subject for a saints' iconography quiz game. 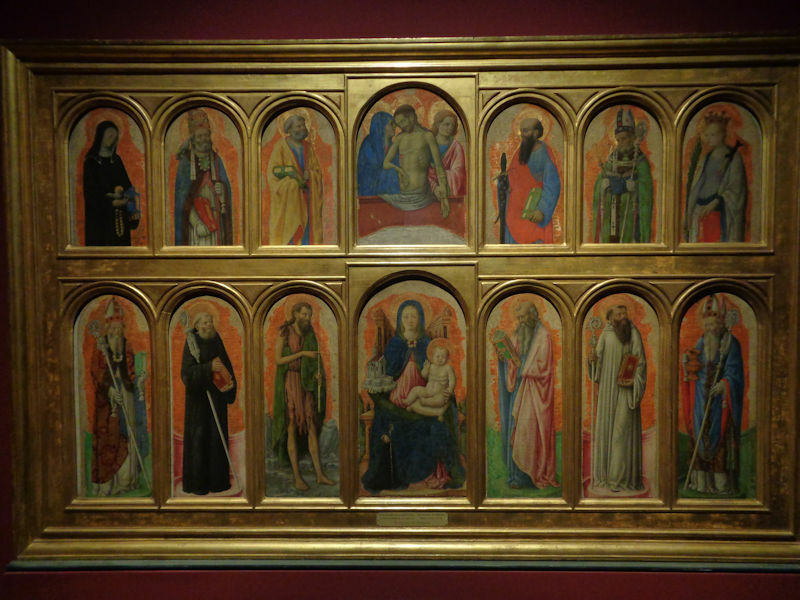 There are a lot of altarpieces here, from all those decommissioned churches and convents. 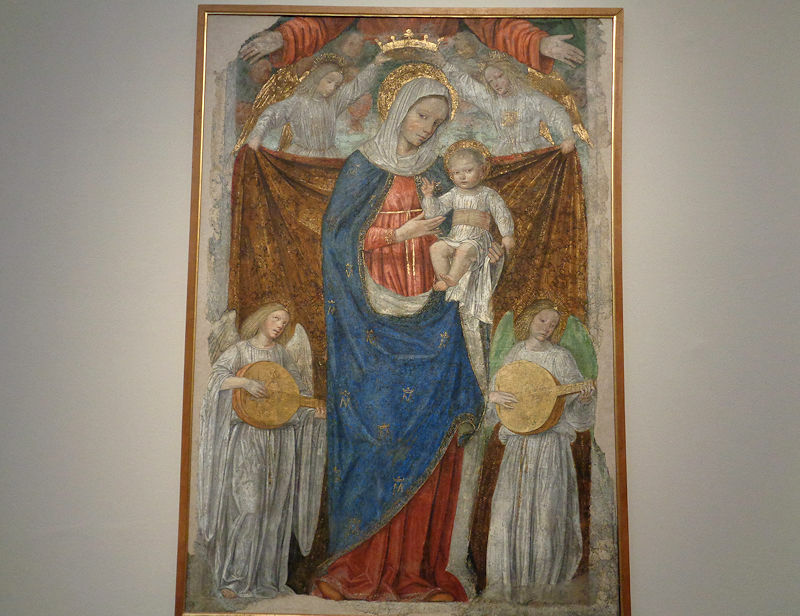 This is a Madonna and Child with a circling cloud of cherubs' heads, attributed to Perugino and/or his friends, early 16th century. 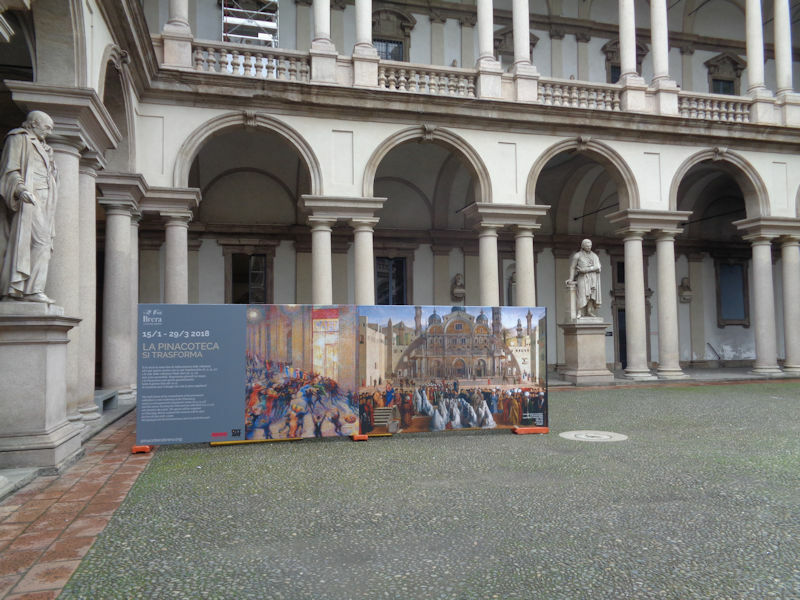 The label points out that in the Brera there are relatively few works from the Florentine Renaissance, because when the Brera was founded Napoleon's forces weren't able confiscate works from Tuscany -- thus the gallery predominates in works from areas they controlled, Lombardy, the Veneto, and, as in Perugino's case, Umbria and the Marche. 'Christ in the tomb with two very cute little angels', ca. 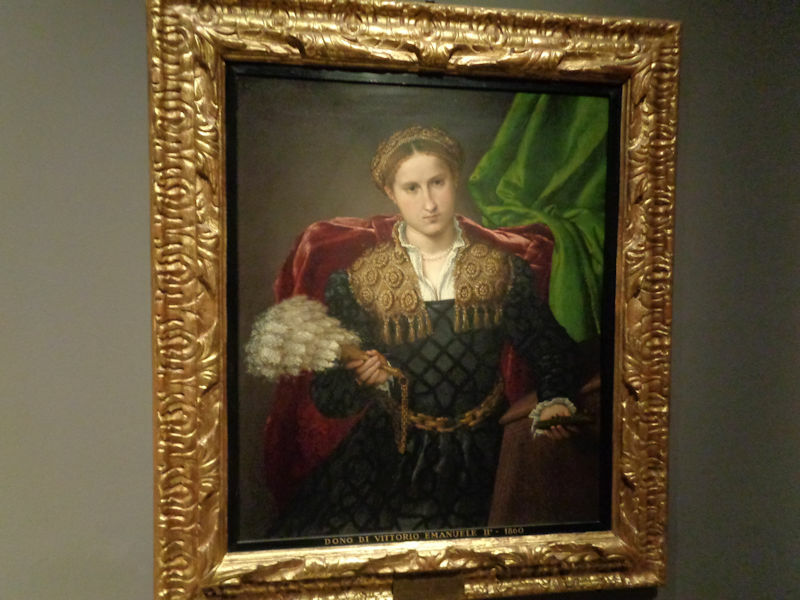 1480, was once attributed to Raphael but is now listed in the column of Pedro Berruguete, a Spaniard who worked in Italy at least 1480-82 and maybe longer, perhaps for Federico III da Montefeltro, and is a leading contender, along with Justus van Gent, for having made the famous painting of Federico with his son Guidobaldo. 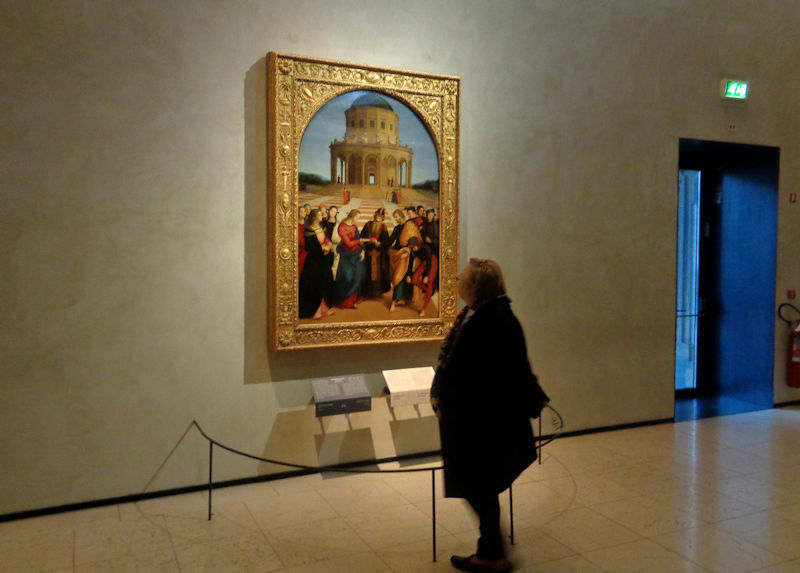 We saw that one in Urbino two years ago, a great picture. 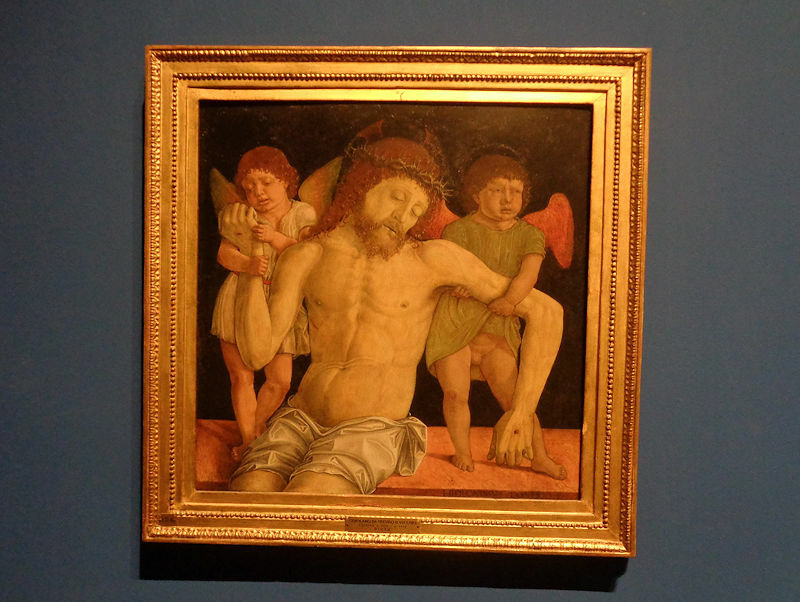 'Christ in the tomb with two nasty little angels', attributed to Girolamo da Treviso (1451-1497), described as having been inspired by a bas-relief by Donatello in Padua. Guess Who. 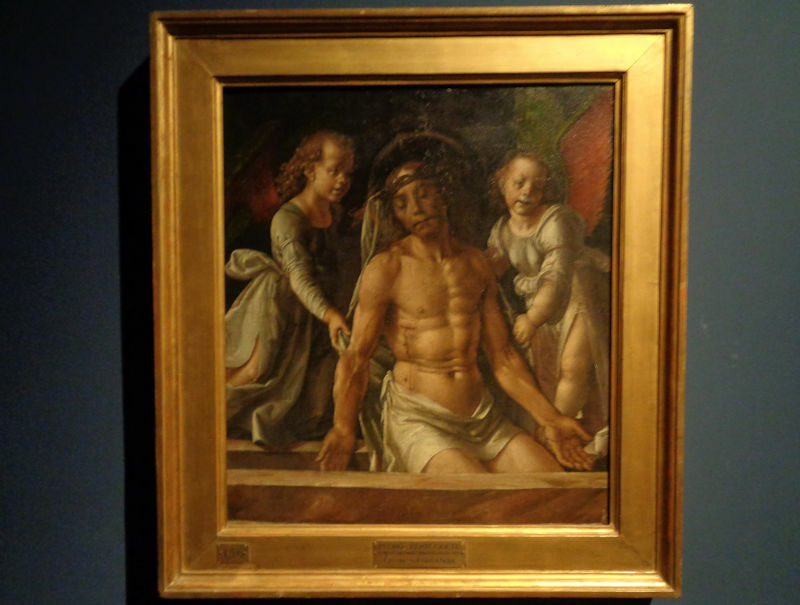 Mantegna's well-known 'Lamentation over the Dead Christ'. 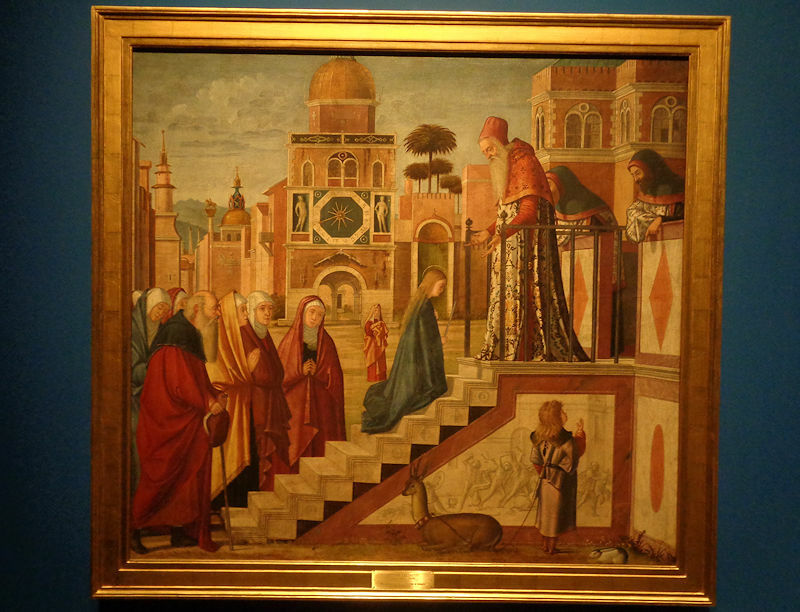 'Presentation of the Virgin in the Temple', by Vittore Carpaccio, an artist whose work the Brera label describes as varying in quality as a function of the size of his paycheck. But the gazelle and bunny rabbit in the right foreground do add a little something. 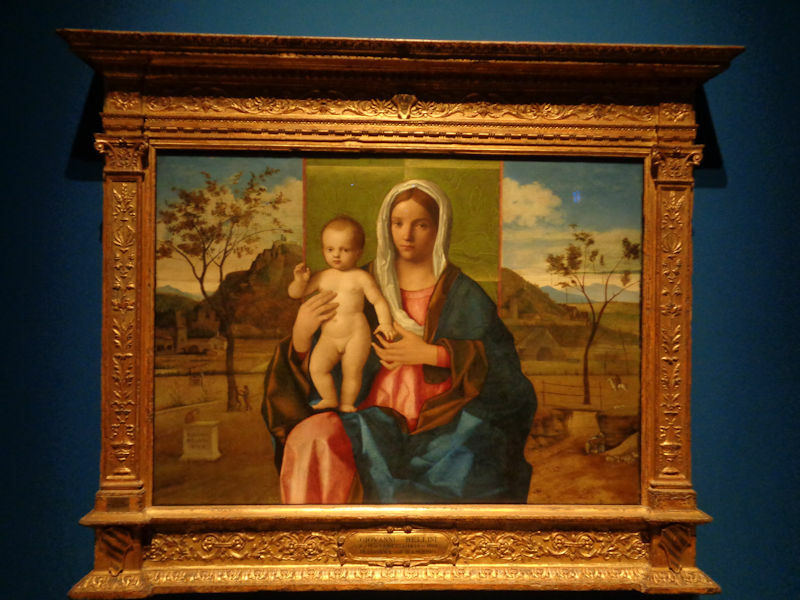 A lovely Madonna and sort of cute Christ child (ca. 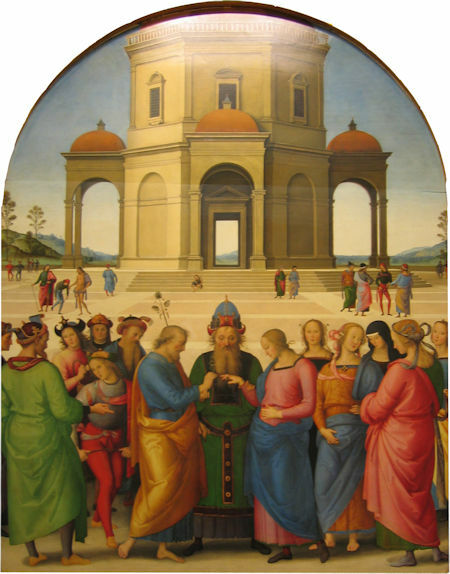 1510), one of Giovanni Bellini's last works. 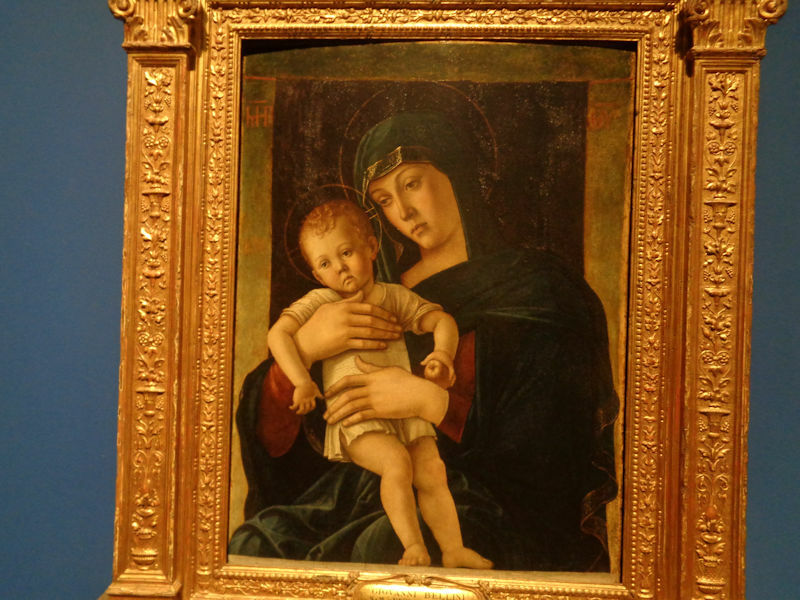 A very sad Madonna and Child, also by Giovanni Bellini, known as the 'Greek Madonna' because of some writing across the top. 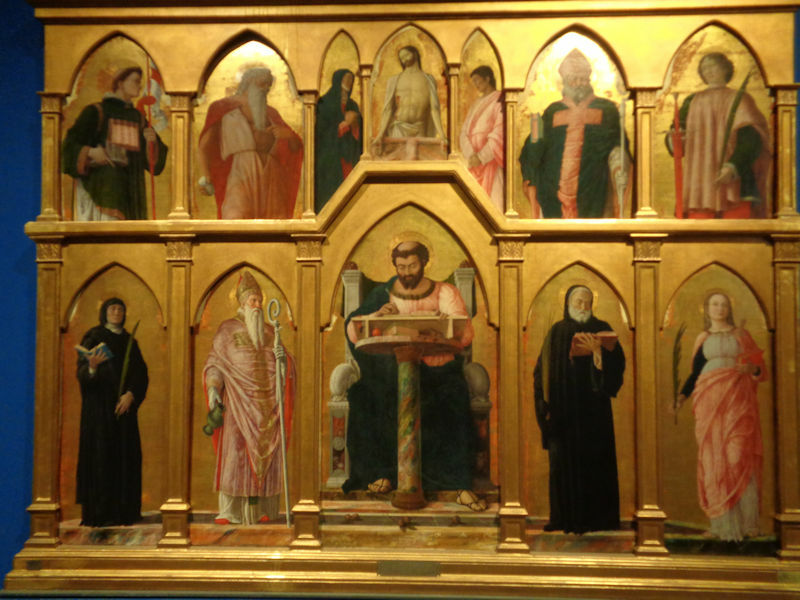 A polyptych altarpiece centered on St Luke, described as one of Mantegna's first works, from the 1450s; the fact that the size of the figures is not uniform is here ascribed to Mantegna's distractions as his sister was about to marry Giovanni Bellini. 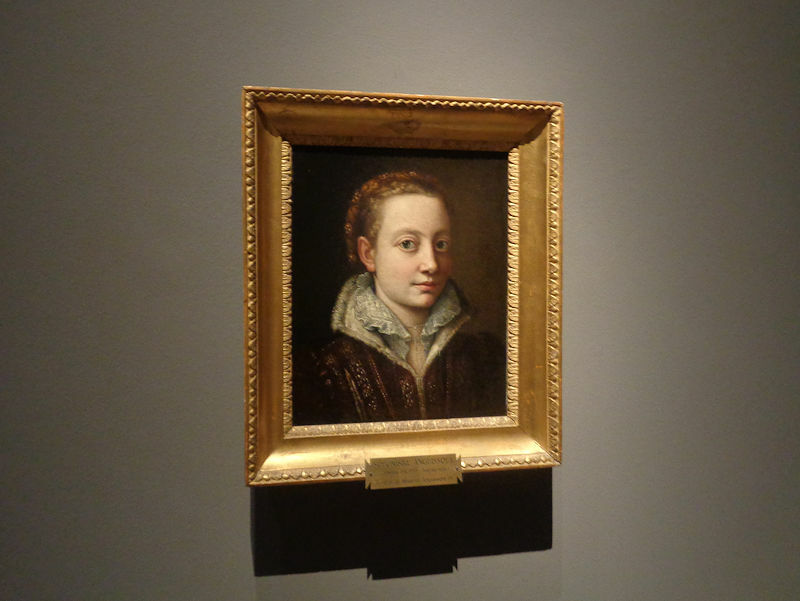 An intriguing self-portrait of Sofonisba Anguissola (c.1532-1625) from Cremona, one of the very few female artists of the era with an international reputation; still in her 20s, she was recruited by Queen Elizabeth of Valois, Queen of Spain, to move to Madrid, where in time she became a court painter to Philip II. On Elizabeth's death in 1568, the King put up a huge dowry for her and married her to the Viceroy of Sicily based in Palermo. When he died in '79 she was comfortably well off and married a sea captain, and lived in Genova for the next 30-odd years. 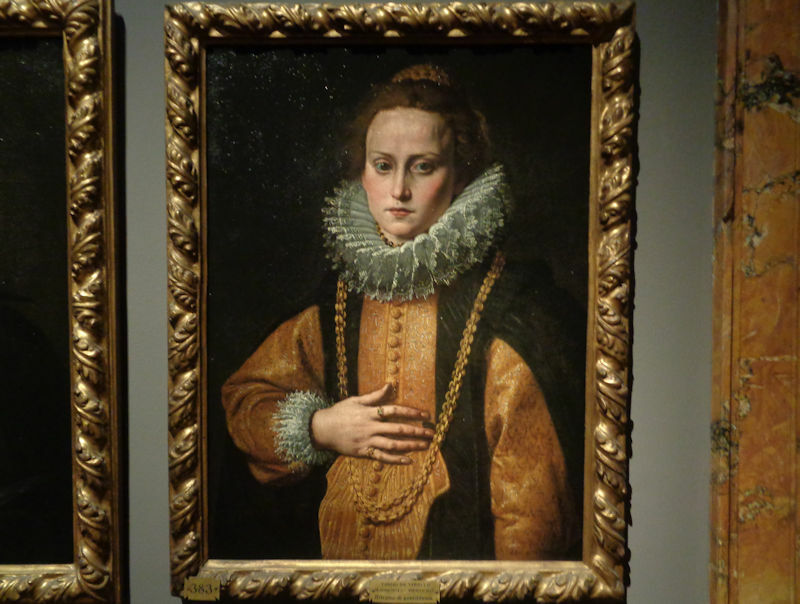 Later, still painting her famous self-portraits up to 1620, Antony van Dyck came to visit her and painted her picture in 1624 at 92 years old. 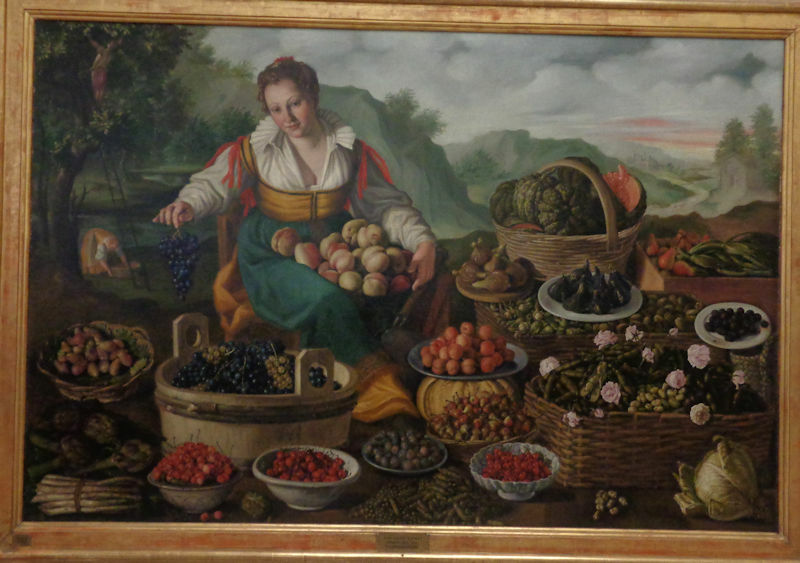 The 'Fruit Seller' (ca. 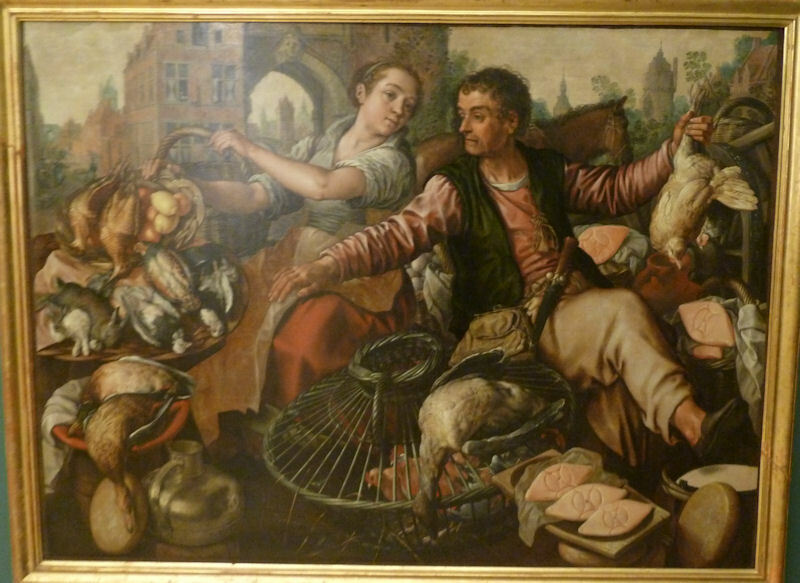 1580), by Vincenzo Campi, of whom I knew nothing, but for combining bourgeois farm and market scenes with cheery young women and still life vegetables and dead animals he bears comparison with my all-time favorite, Joachim Beuckelaer of Antwerp (1533-1574). As here. 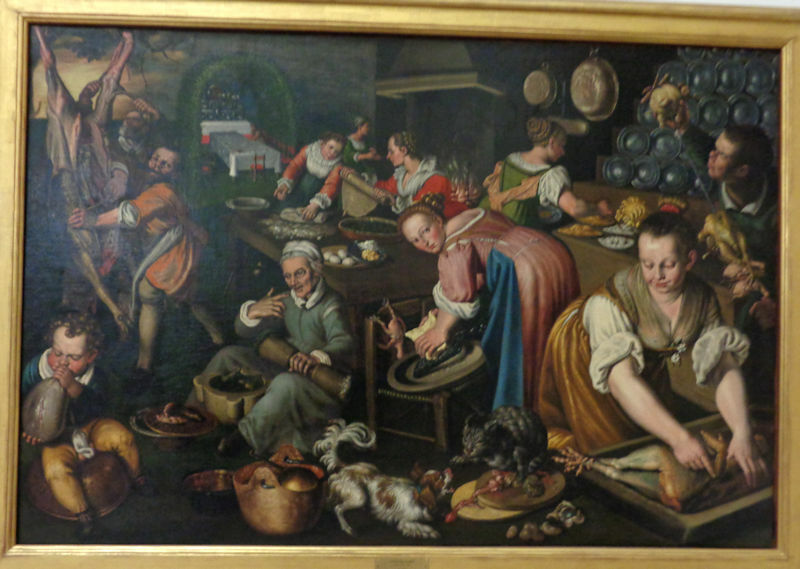 More Vicenzo Campi, 'The Kitchen', 1590 -- hours of fun. This poor man is a restorer, or masquerading as a restorer, locked for hours in that educational demonstration cell, walking slowly back and forth and certainly looking like any moment he's going to resume restoring. 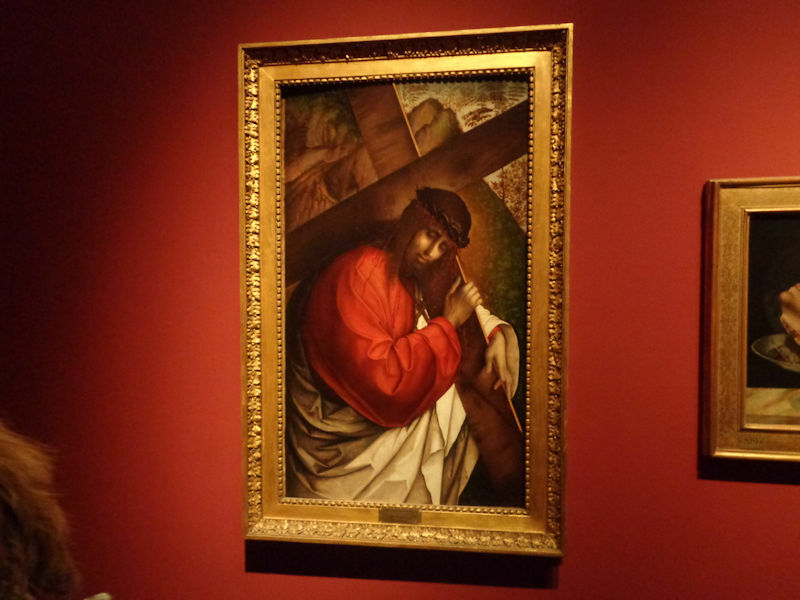 'Christ with his cross' by Francesco Zaganelli da Cotignola, showing (it says here) his interest in Albrecht Dürer. Fair enough. 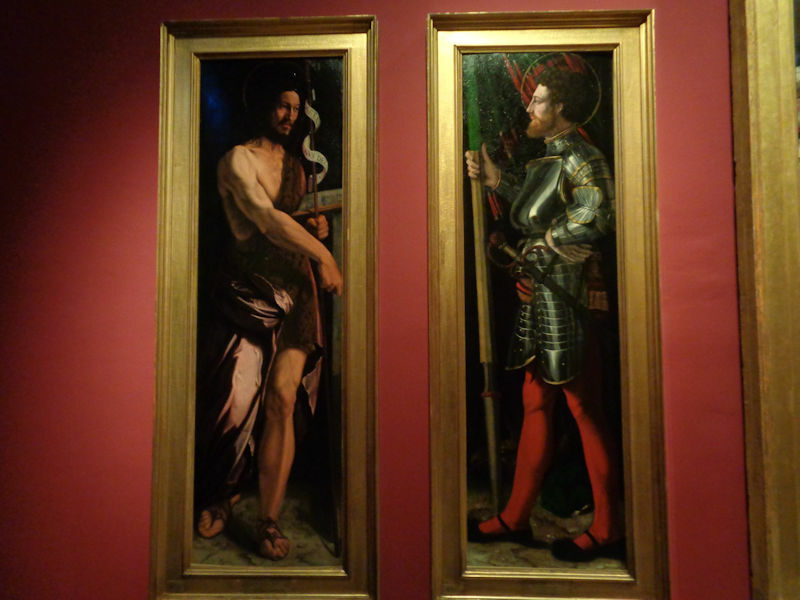 St John the Baptist and St George, once flanking a Madonna and Christ, early 16th century, by Dosso Dossi, the longtime chief court painter for the Este court in Ferrara and Modena. 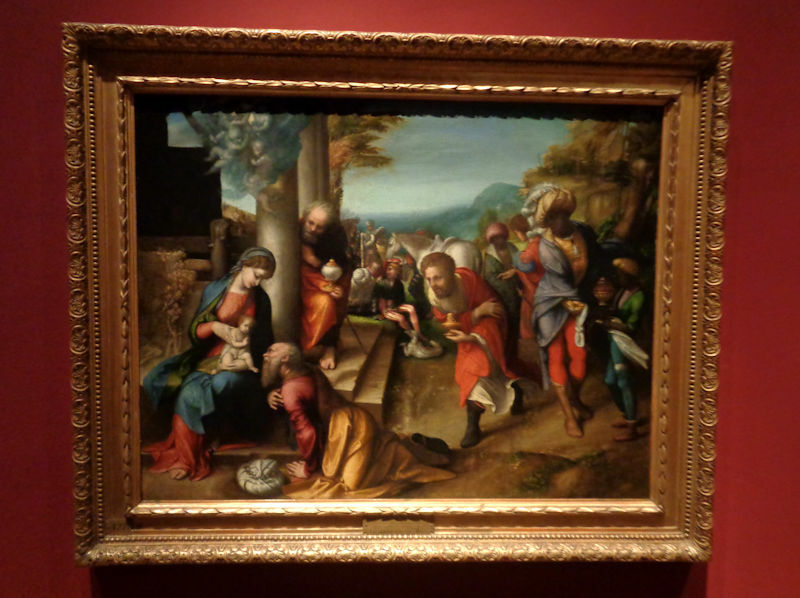 'Adoration of the Magi' by Correggio, early 16th century; the centre of the picture seems to be way over on the left. 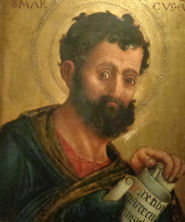 Madonna and Child with Saints (called the 'San Domenico Triptych'), by Carlo Crivelli, late 15th century, with the right panel showing St Peter Martyr of Verona with his machete planted in his head, and St Venantius holding the city of Camerino in the Marche, of which he was the patron saint. 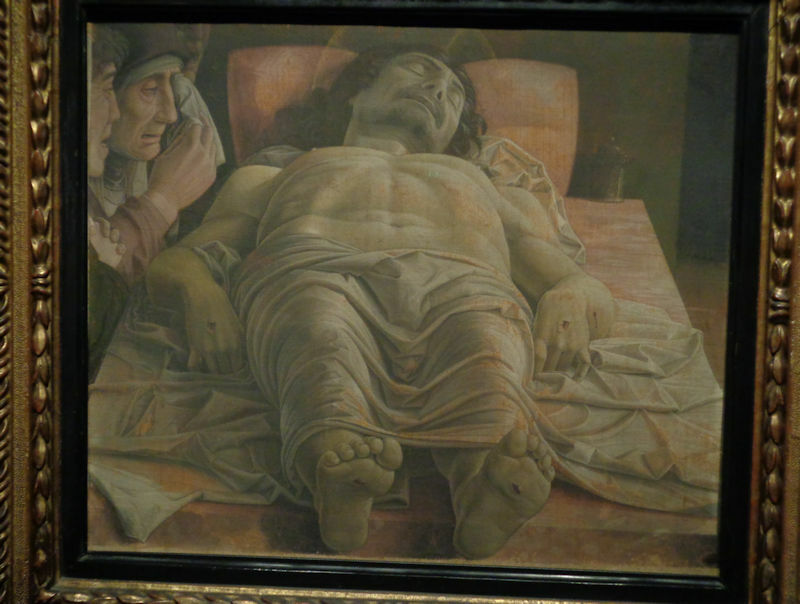 Venantius, 15 years old in the traditional stories, was tortured in many innovative ways and decapitated in Camerino in about 253 (in the 'Decian persecutions'). Some items, like St Peter's keys and crozier and the knife in Peter Martyr's chest, are shown in relief. 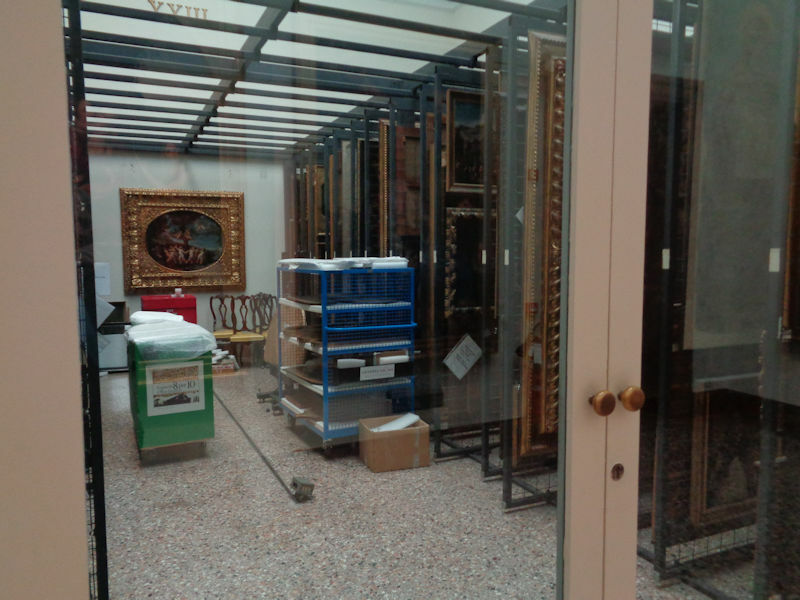 In a couple of places, the Brera provides a peek into storage areas for works not on public display, with an odd note explaining that there's no need to worry, all the good stuff's out front. 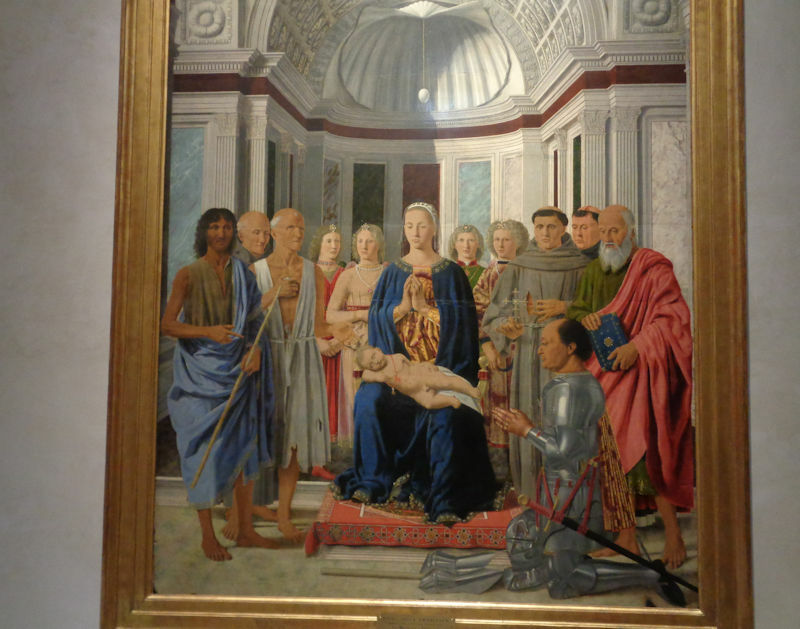 The classic Piero della Francesca picture (the 'Brera Madonna' or 'Montefeltro Altarpiece') from about 1472 of the Madonna and Child with Saints and Angels, and the wonderful representation of the donor dominating the foreground, Federico III da Montefeltro, Duke of Urbino, the great military commander and patron of the arts. In full armor, no less. He always posed himself in profile because he'd lost his eye on the other side in a joust -- the story about the bridge of his nose (true or not) is that, realizing that without his right eye he could no longer see soldiers coming at him from that side, he hacked out the top of his nose so that he could see them with his left one. 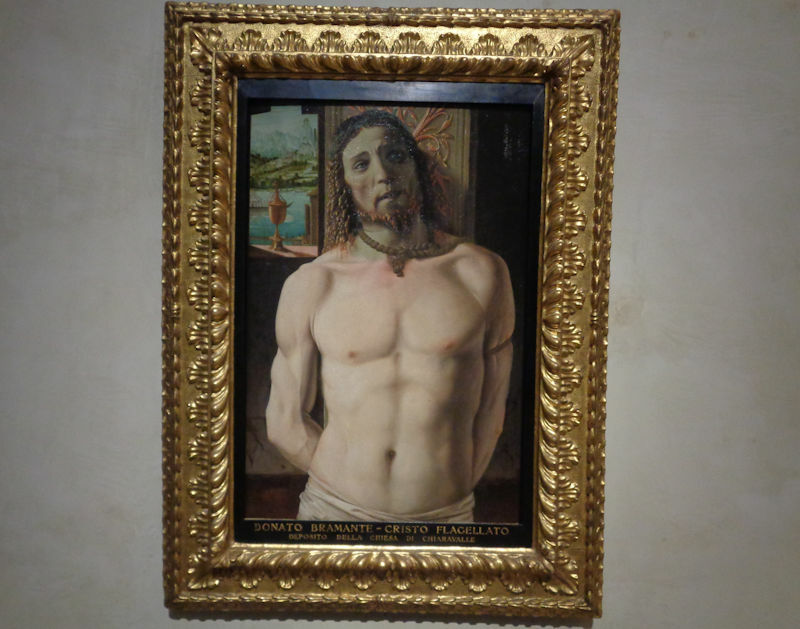 Bramante's Flagellation of Christ (called 'Christ at the Column'), ca. 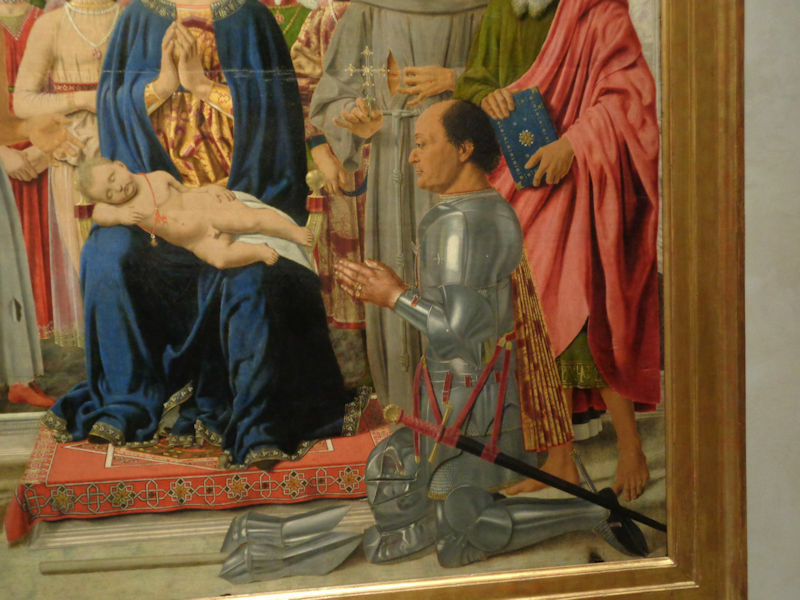 1490, but in this case without all the flagellators. 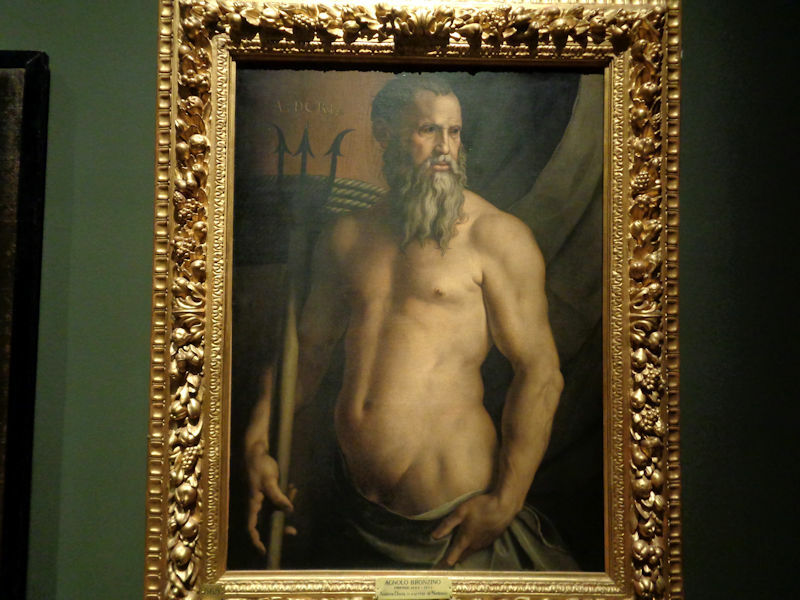 Bronzino's portrait of Andrea Doria as the sea god Neptune, ca. 1530, when the great Genovese naval commander Doria would have been about 60 -- it's said that the emphasis on the intimidating musculature on an old fellow may just be symbolic of his military successes and fame, but his military career, in the service of both the French and their enemy the Empire alternately, continued for another 25 years or so. 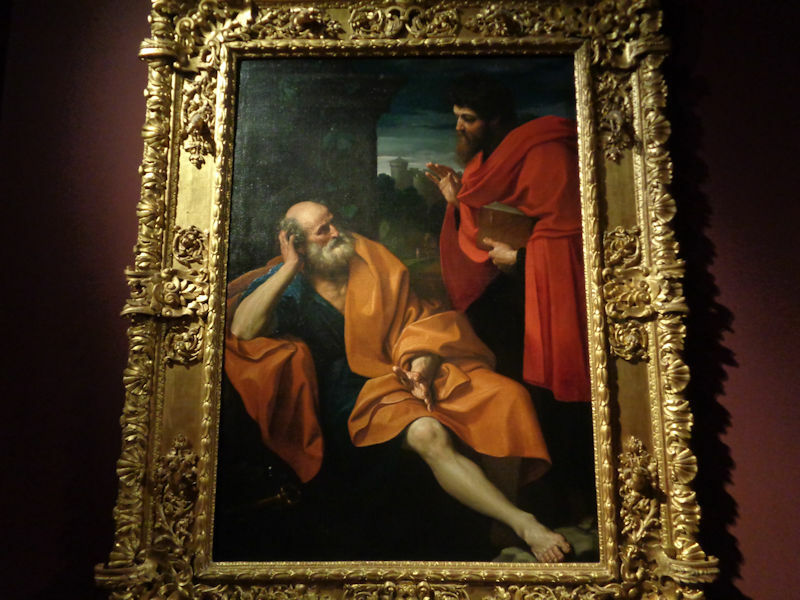 Guido Reni's picture of St Paul rebuking St Peter, who's tearfully apologetic, dated 1605, does not seem like the most exciting of his works, but it's the only Guido Reni work we noticed here. 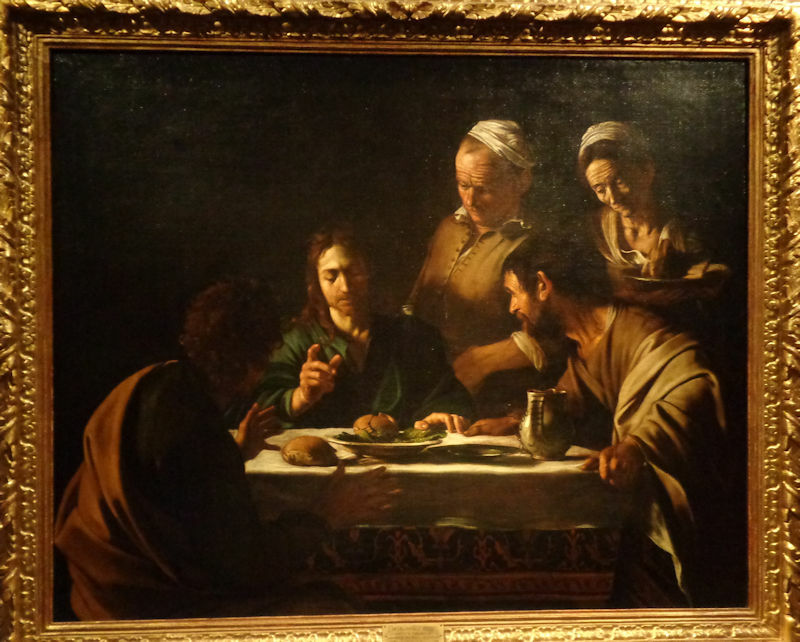 Caravaggio, of course, the 'Supper at Emmaus'; there is a 1601 version now in London, probably a bit superior to this one from 1606, which was painted when he was on the lam on murder charges. 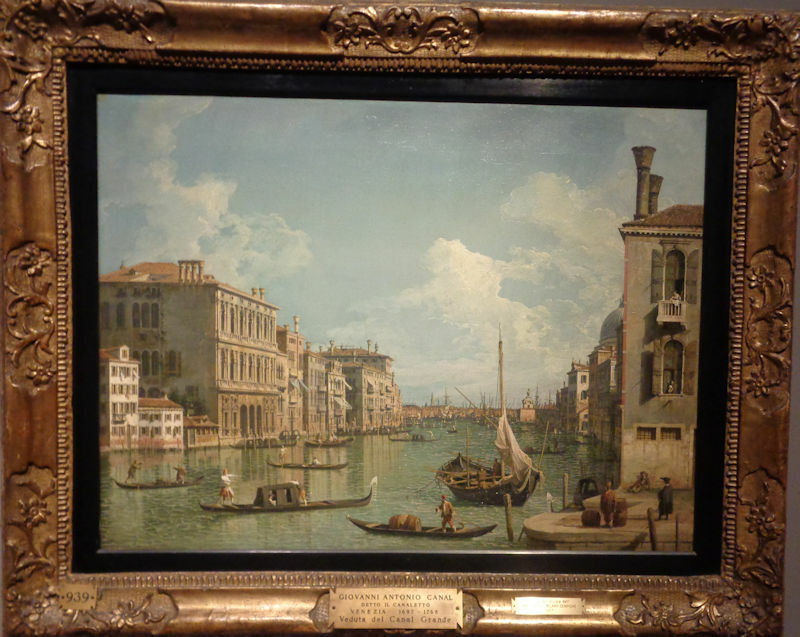 It came to the Brera from the original owner's descendants and the attribution is said to be undisputed. 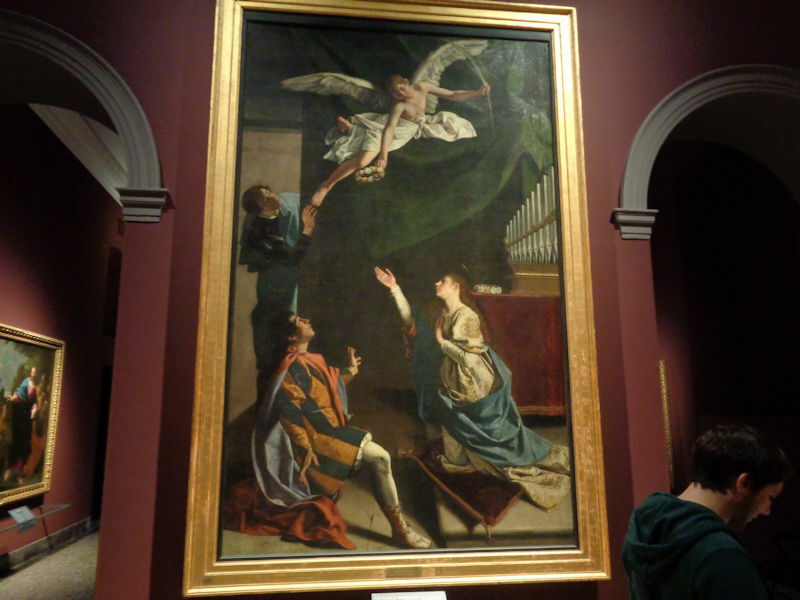 'The Martyrs Cecilia, Valerian, and Tiburtius', ca. 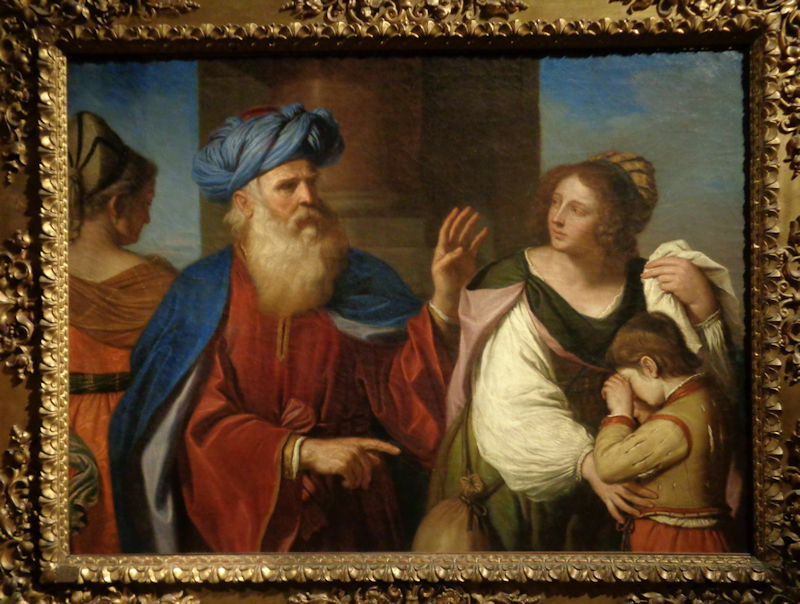 1607, by Orazio Gentileschi, Artemisia's dad -- according to the label, it shows evidence of Caravaggio's influence upon Orazio from their association in Rome. 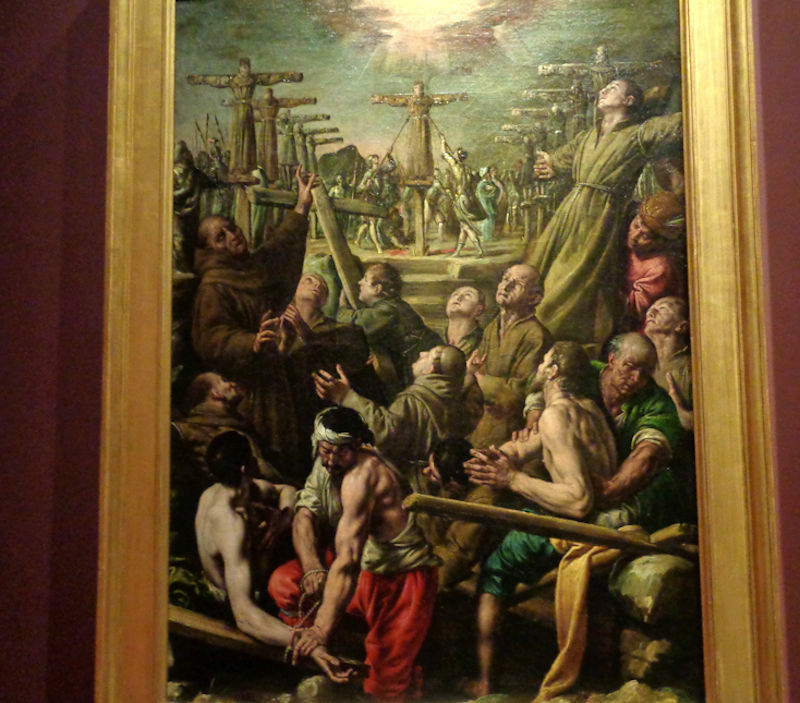 This is the 'Martyrdom of Franciscans in Nagasaki' by Tanzio da Varallo, early 17th century, who was responsible for much of the large-scene artwork at the Sacro Monte at Varallo. 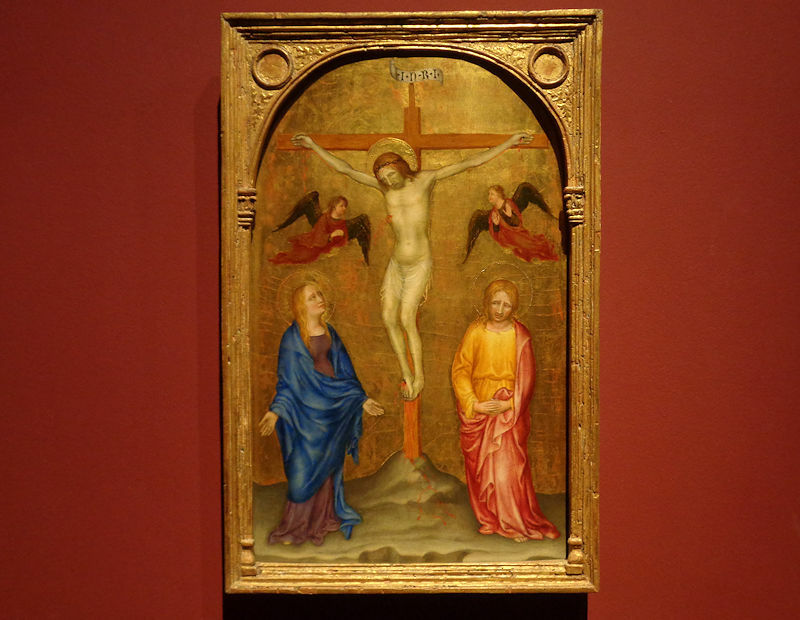 The Franciscans of the time, who were sending lots of brave missionaries out to places where they were profoundly unwelcome, were obsessed in their art commissions with horribly brutal tortures and executions of Franciscans. Like these in Assisi. 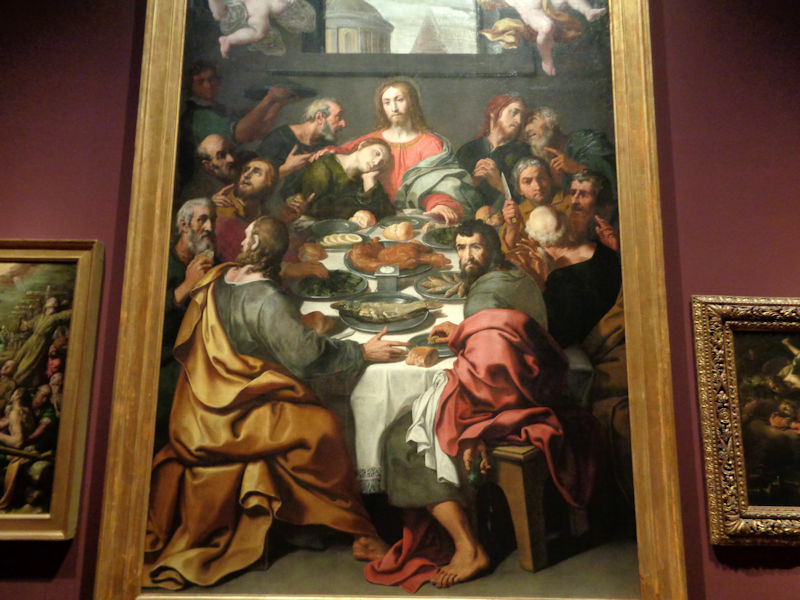 We're borderline obsessed with pictures of the Last Supper, mainly to see what they were eating (besides the bread and wine, of course), and frequently it's just a rat or something entirely unidentifiable. 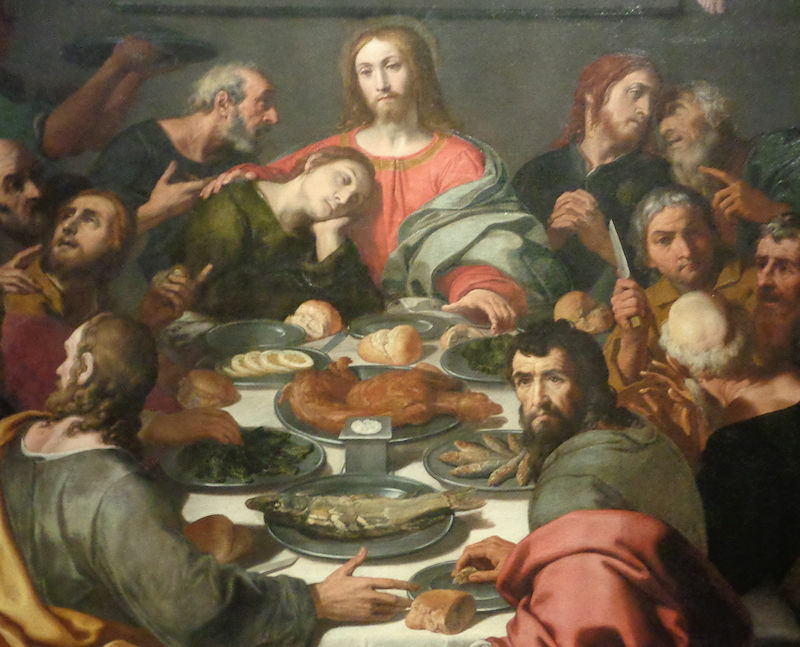 Here Judas looks just as furtive, but Christ and everyone else look more focused. 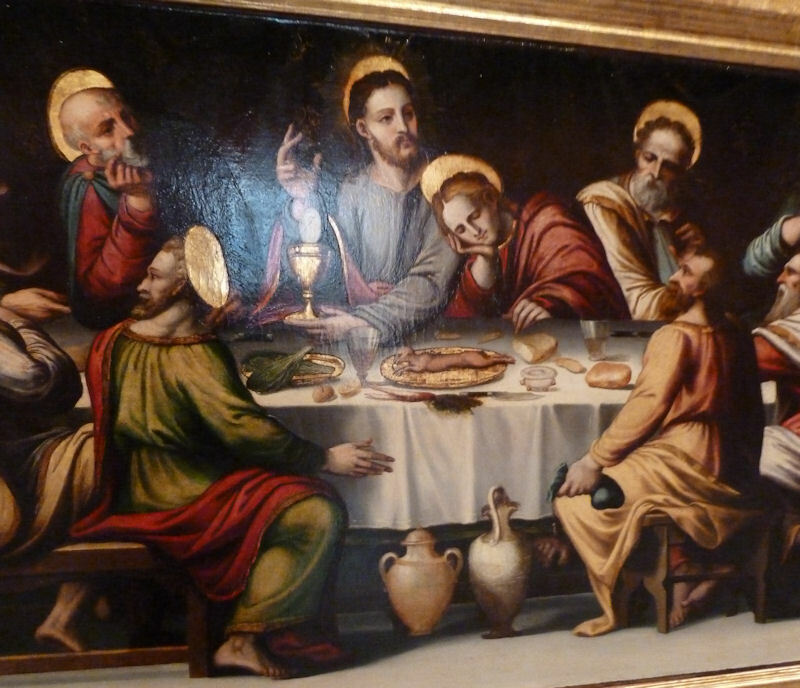 It looks like the bread and wine is about all they're getting for dinner tonight. 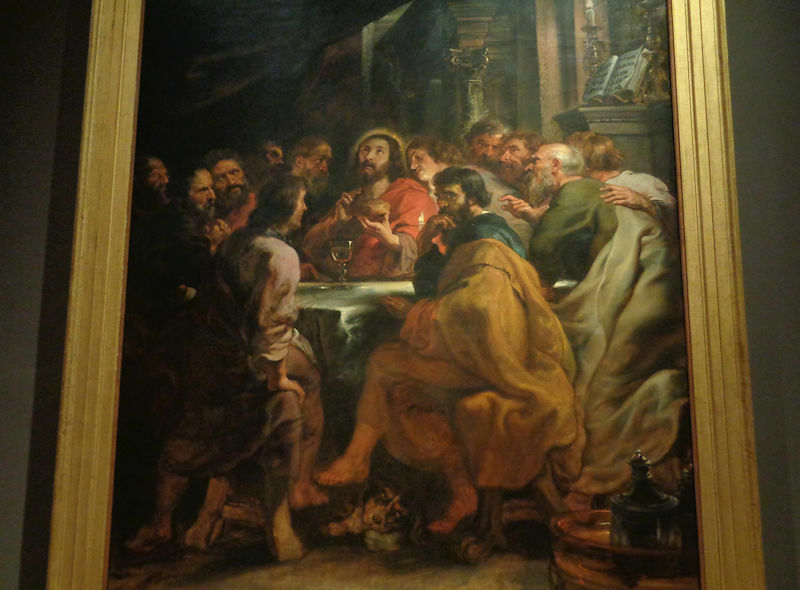 This is by Rubens, 1630-31, with help from his assistants for the unimportant bits. 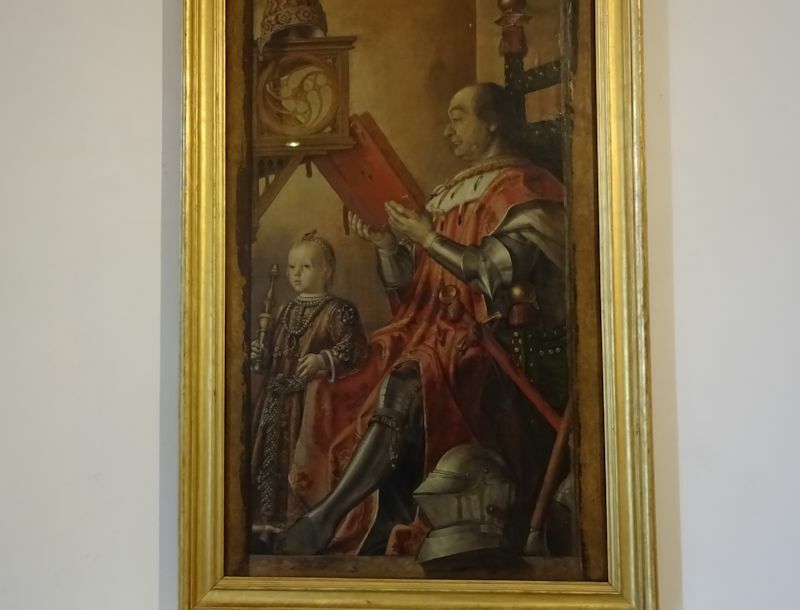 This too is by Tanzio da Varallo, a portrait of a lady, alongside a companion picture of her husband or whatever that's not so interesting. The lacy ruff alone must have taken a week to do. 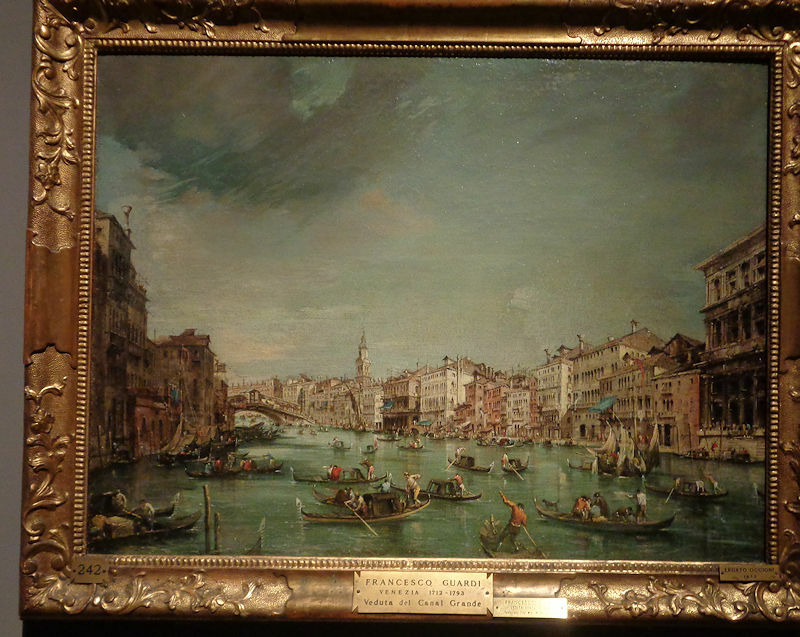 This is a familiar sort of Canaletto Venice scene, the Grand Canal, 1740-1745, juxtaposed with . . .
. . . a similar scene by Francesco Guardi, thought by the Brera's label-writers to depart from Canaletto's calm scenes 'with a nervous unrest . . . which cause[s] his figures to vibrate and the buildings to look dilapidated, conveying the charm of a city still splendid even in its twilight years'. 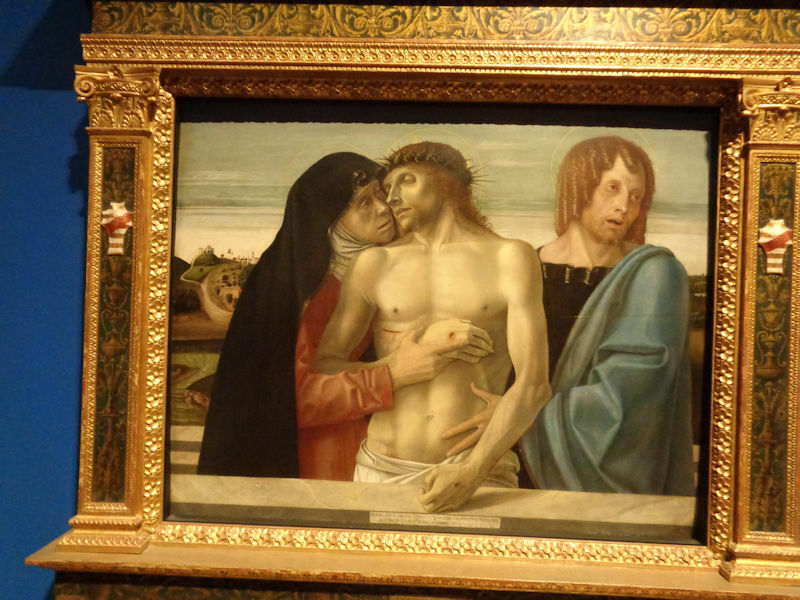 We should point out that an awful lot of the Brera's pictures are available in professional reproductions on the Brera website, http://pinacotecabrera.org/en/. We're on our way out the door now . 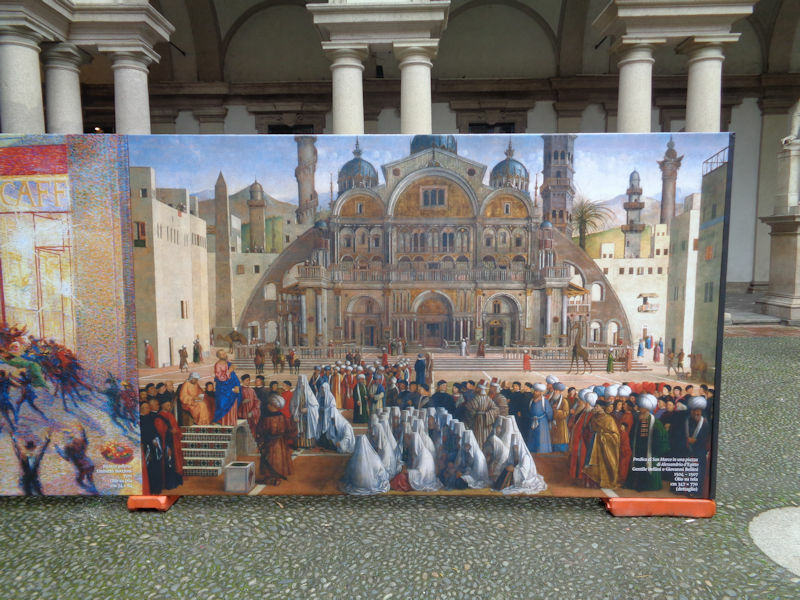 . .
. . .ushered along by this huge promotional reproduction of 'St Mark preaching in the main square of Alexandria', a monumental work by the brothers Gentile and Giovanni Bellini in about 1505. 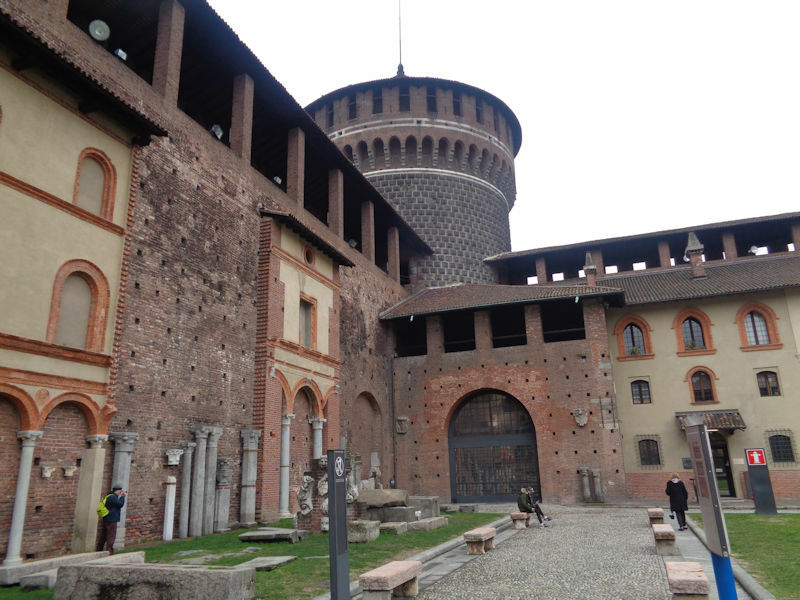 Next, after a restorative lunch in a elbow-to-elbow tourist restaurant near the Brera, we're off down the street to visit the Castello Sforzesco. Feedback and suggestions are welcome if positive, resented if negative, . All rights reserved, all wrongs avenged. Posted 23 March 2018.